Mt. Rinjani or Gunung Rinjani is an active volcano on the island of Lombok in Indonesia. Standing at 3,726m, it is the second tallest volcano in Indonesia after Mt. Kerinci. Besides the satisfaction of reaching the summit, another attraction of Mt. 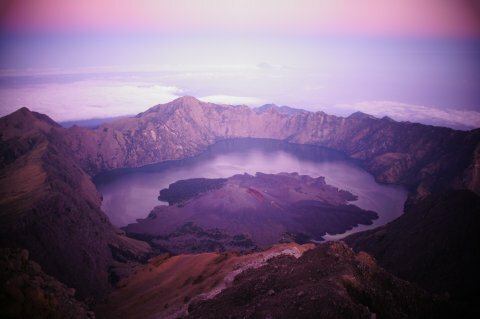 Rinjani is to catch the magnificent view of the turquoise crater lake of Danau Segara Anak and Gunung Baru rising from it. So even if one does not intend to ascent the summit, it is still a worthwhile hike to the crater rim for the views. Disclaimer: This trip was taken in August 2012. The information is provided ‘as is’ with no warranties and confers no rights. If you are interested to know more, please add a comment and I will update the post with more details. I am really envy you!